Beomaster 2400 together with Beomaster 1900 were two advanced FM stereo receivers. They had identical technical specification and performance. Both were easy to use and easy to live with. 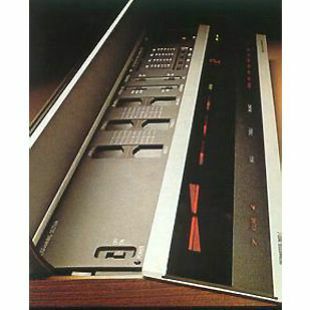 Beomaster 2400 had the additional convenience of a cordless ultrasonic remote control module by which you could operate radio, amplifier and Beogram 2400 or 4004 record decks from a distance. Both receivers had touch-sensitive controls for operating the features and functions you used every day. All the secondary switches and adjustments were protected beneath a hinged lid, but an illuminated readout panel showed you the set's operational status at a glance. Equipped with the slim remote-control module you could select between four pre-set radio stations or record player input, adjust the volume up or down or put the System into Stand-by. The illuminated panel with its large display allowed to to easily see the state of play from anywhere in the room. The phase-locked loop decoder ensured a wide separation between stereo channels and remained stable over a very long lifetime. When a stereo broadcast was received, a symbol 'S' lit up automatically on the fascia of the set. Automatic Frequency Control (AFC) kept the selected radio station spot on tune, and a muting circuit cut out inter-station noise during tuning. 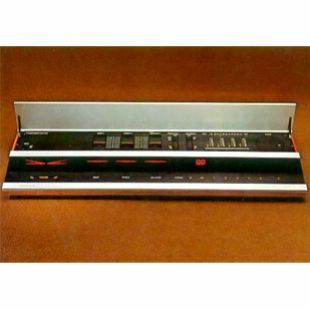 The stereo amplifier produced 2 x 30 watts RMS of high-fidelity output and had DIN sockets for the connection of two pairs of speakers, a record-player and a tape or cassette recorder. A headphone connection was provided beneath the front edge of the unit. Controls not needed every day were situated beneath a hinged lid. These included tone and balance adjustment, FM pre-setting, loudness, AFC and MONO/STEREO switches, and a switch for selecting a basic initial volume level. This facility allowed you to choose the volume at which the amplifier began to play each time it was switch on - no matter how controls were left the previous time. On its primary control panel Beomaster 2400 had no knobs or buttons. The panel functioned electronically and needed only the contact of your finger to activate it. However, the ultrasonic remote control would have proved more useful. The set's sophisticated indicator system would tell you instantly that your commands had been obeyed. 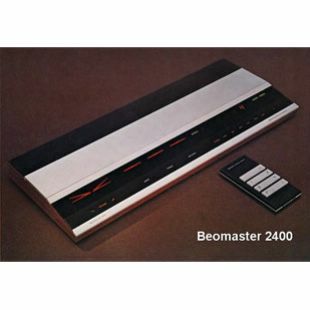 Beomaster 2400 was superceded by Beomaster 2400-2 in 1980. Top Tip! If you're having problems obtaining the necessary battery for the Beomaster 2400 remote control, try using one AG13 button battery together with seven AG12 batteries connected in series. Bound by adhesive tape they fit exactly lengthways and work a treat!